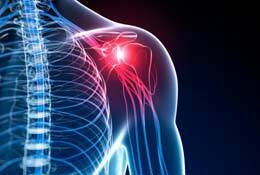 We can help with Shoulder pain and Frozen shoulder. Often Shoulder pain is caused by mis-alignment of the Shoulder joint. If you suffer from Shoulder pain – we provide Chiropractic Manipulation, Physical Rehabilitation, Therapeutic Massage and Myofascial treatments specific to the recovery of Shoulder pain and injury. If you suffer from Shoulder pain or an injury? Frozen shoulder syndrome, or adhesive capsulitis as it’s medically termed, occurs when ligaments around the shoulder joint swell and stiffen to such an extent that normal healing doesn’t take place. This makes it difficult to move the shoulder, making everyday activities such as getting dressed or reaching for a cup from a shelf painful. As the condition progresses, the stiffness may continue to the point where range of motion can be severely limited. Research has shown that diabetes patients are more than twice as likely to suffer with condition, and other risk factors include recent surgery, having a stroke, overactive or under active thyroid and heart disease. If you suspect that you have frozen shoulder, see your GP for a diagnosis. Your doctor should also rule out shoulder arthritis via a scan or X-ray, as it produces similar symptoms. With frozen shoulder the surfaces of your shoulder joint are normal and motion is limited because the tissues surrounding the joint have become tight, preventing you from moving your arm and shoulder as you usually would. With shoulder arthritis the joint surface is damaged. Patients can take anti-inflammatories and painkillers to help with the pain. Most patients with frozen shoulder respond well to home exercises when they are done regularly. Physiotherapy is offered to patients with frozen shoulder, providing them with exercises they can use at home as well as helping to stretch and loosen the muscles during regular sessions with a professional. If a patient has done regular exercises and seen no improvement, a doctor may recommend going under anaesthetic in order to have the muscles and joints manipulated (massaged and stretched). Another option is to try injecting corticosteroids to the affected area. Some patients may find this is all that’s needed to relieve pain and improve movement. If manipulation under anesthetic and corticosteroid injections aren’t successful, your doctor may suggest surgery, although this is only in severe cases. Corrective surgery works to loosen the tissues surrounding the joint. Many patients may prefer to seek out non-invasive treatments before going down the more drastic surgical route. Some patients have found acupuncture to be effective, even though, as yet, research hasn’t shown that it produces significant results for all patients with frozen shoulder. Acupuncture works by pinpointing certain pressure points on the body, thereby reducing inflammation. Another non-invasive treatment that has shown particular promise is the Niel Asher Technique. Research from Cambridge University Hospitals looked at the Niel Asher Technique (NAT) – a method involving the manipulation of muscle tissues and joints, applying pressure and stretching – and found that it was more effective than standard physiotherapy. The researchers found that range of motion for FSS patients undergoing NAT treatment improved by 52 degrees, compared to 24 degrees for standard physiotherapy and 0.8 for placebo treatment. The NAT method also gave patients greater strength and power than physiotherapy. Dr. Kell Fullerton uses the NAT technique. Unlike physiotherapy NAT treatment is applied with the intention of ‘resetting’ the brain with regard to its nerve impulses to the injured area. The idea behind this is that with frozen shoulder the brain has effectively cut off nerve signalling to the area which is why healing isn’t taking place. The manipulations of the shoulder joint and tissues are designed to target nerve receptors so that signalling to the brain is increased and healing can begin. More research is needed, however, to identify why the NAT treatment is more effective than standard physiotherapy and from there, treatment could potentially be refined further. What can I do about frozen shoulder right now? Taking painkillers will obviously help reduce the symptoms you’re experiencing but that won’t resolve the issue. There are, however, some things you can try yourself at home. Gentle movement is key to improving the symptoms of frozen shoulder. So while you don’t want to put yourself through painful motions, you need to make sure you are stretching and moving regularly. Applying a warm compress to the area can help a great deal in alleviating pain and also increasing blood flow to the area, thereby potentially helping the body heal. If you’re in the early stages of frozen shoulder bad posture can make it worse. Make sure you’re sitting in a good position when you’re working at a desk or reading or while watching TV on the sofa. “When you’re standing, try to keep your arms away from your body by hooking your thumbs into your belt loops or pockets. This could help prevent the symptoms worsening. One pillow is for your head, as usual, the other is to go between your elbow and your body (on your affected side) so that your arm is held slightly away from your body. “This abducts the arm away from the body, which stretches the subscapularis muscle. If you usually sleep on the side where you have no pain, put the pillow in front of you and hug it, to help keep your arm away from your body. Hanging arm. Put your good hand on a table or counter-top in front of you (at around hip or thigh height). Lean forward so that your ‘bad’ arm hangs down. Then gently rotate your hips as though trying to spin a hula hoop, so that your arm also swings. This very gently stretches the shoulder joint and tissues. Do stretches for between 10 and 20 times, depending on your comfort level.